Master Masons Of Sikandra | This Jaipur! On Jaipur-Agra Highway (NH.11) near sikandra on both sides of the high way(For approximately 6 kms)you will see an open air market -shops selling wares made out of sand stone.Their forefathers built rajasthan’s fort’s and palace’s and temples and the colonial buildings in New Delhi and else where. Now a days they make Jali’s,pillars,idols of various gods,fountains,likeness of birds and animals in stone.They make judicious use of modern machines and artisans in their work. Their work is in great demand in the various metros of India. 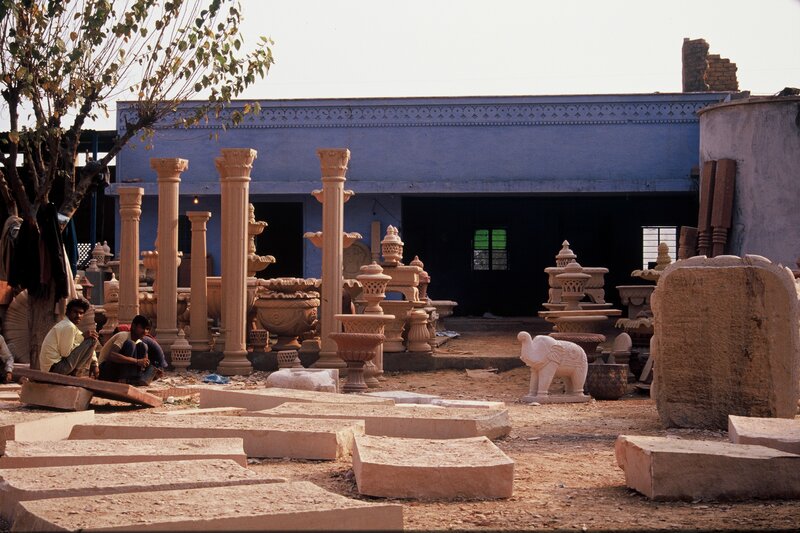 There are about 500 workshops where about 7000 workers carve stones for their livelihood.Most of the artisans are from the near by villages.Some workers are from other states also.Some 100 shops sell ready to buy stone artifacts.These are the sermons in stone of master masons of Sikandra. This entry was posted in Accomodation, Around Jaipur, Blogroll, City Life, Comments, culture, Details, GuestHouse, Hotels, india, Jaipur, rajasthan, rajasthani, Sculpture, Shopping, Travel, Uncategorized and tagged Agra, Bildhauer, Colonial Buildings, dausa, escultor, Forts, india, Jaipur, Jaipur Agra Highway, Jalis, Masons, Maurer, metro, muler, murare, muratore, National Highway eleven, NH 11, Palaces, rajasthan, Sandstone, sculpteur, scultore, Sikandra, skulptor. Bookmark the permalink.